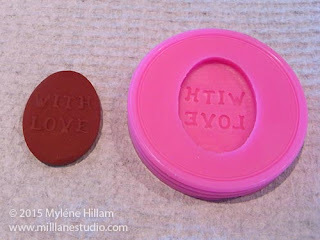 A few weeks back I shared how to create a silicone mould for casting tags that will be attached to the bonbonnieres for my daughter's wedding. With the mould made, it's now time to cast the 100 tags needed. 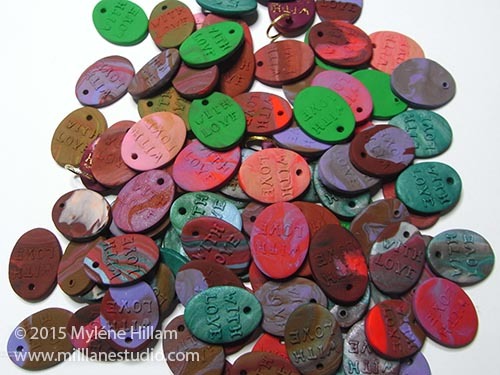 We chose polymer clay as the casting medium for the tags - it gives them a nice weight. And because they will all be painted later on, we were able to use up lots of scrap clay that I had in the studio. To begin, roll out the clay to the thickness of two wooden stir sticks. Timesaving tip: Use a pasta machine to roll out a whole sheet of clay to the desired thickness rather than rolling out enough clay for one or two tags at a time. My brain was a bit foggy with project overload before the wedding but if I had been thinking clearly, I could have saved a heap of time! 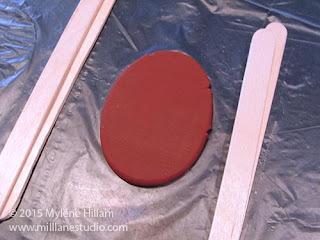 Cut the clay using the same oval cutter that the mould was made from. Insert the cut tag into the mould positioning it so that it lines up. 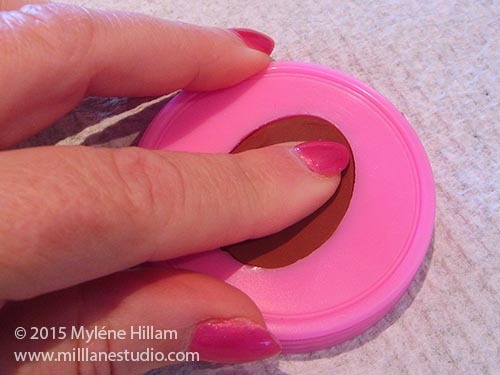 Press the clay down into the mould so that the clay is impressed with the pattern. 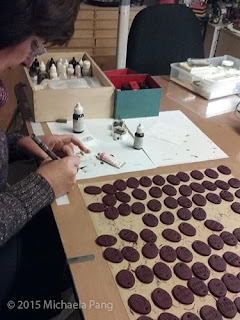 Carefully remove the clay from the mould. 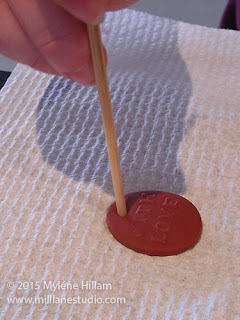 Use a bamboo skewer to poke a hole in each one and then bake in the oven following the manufacturer's instructions. 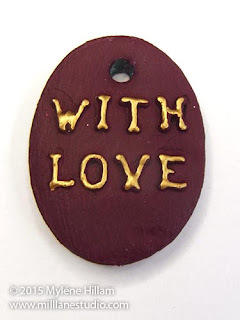 This was a great way to use up a lot of scrap clay and the tags were actually quite pretty - it was almost a shame to paint them. But paint them, we did! 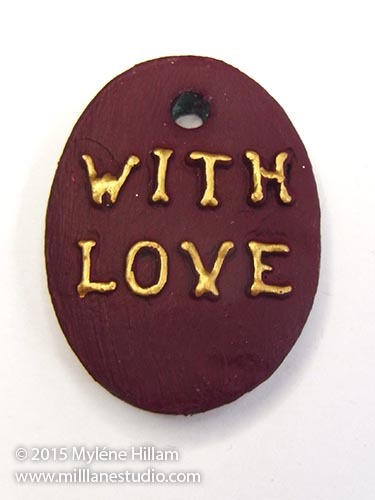 After painting with a couple of coats of very dark burgundy craft paint, the raised lettering was highlighted with a gold marker to add the finishing touch. 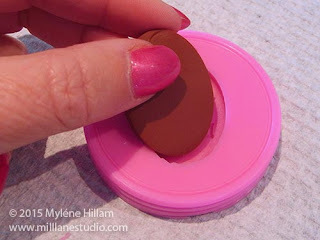 In my next post the bonbonnieres will really begin to take shape. 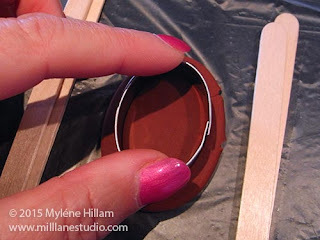 Join me to see how they turned out!